Harrod Cup, HA1 in the Chapman, and Championship Section of the Counties. Michael was our hero of the day scoring a half point in his second game, having had chances in the first. Gary's board was at the other side of the room, so we didn't see much of what was going on there. Dave and i did not do well. A strong Shepshed team narrowly took a win from our first Chapman Cup side. Heathcote's chances in the Birstall Cup now look better. Draws for both Grahams (leaving both on 1.5 points). Wins for Sean and Rajan (leaving both on 1 point). This week, our club AGM is on Tuesday (bring your cheque book), where there might be the chance of a few friendlies after the business of the evening, and the lower sections on the Counties will be at Wigston on Thursday. Graham B reports a 4-4 draw against Loughborough. I think Wigston was expecting to play our first team. On the night, our team was essentially HA3. The grade difference gave us the maximum handicap bonus. We therefore only needed a draw on one of the boards in order to win the match. Wigston won the toss and chose the white pieces on the even numbered boards. We rarely, if ever, get to compete with players as strong as this, but we surprised ourselves at how long we are able to last. Unsurprisingly, against the County Champion, i was the first to bite the dust at around 9PM. We were 23 moves in and the outcome by then was obvious so rather than drag things out any further, i resigned. Alan was kind enough to talk me through the game afterwards and showed me lots of ways that i could have hung on for longer, but still lost. This was really useful. Afterwards, Fritz was not able to tell me anything that Alan had not. 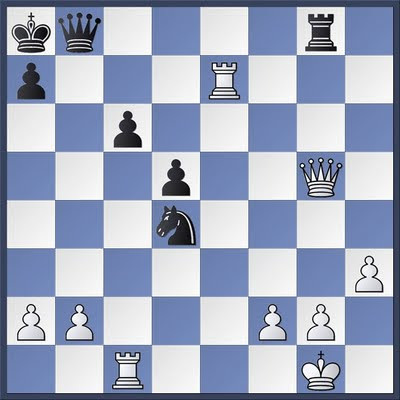 Michael, with the black pieces, pioneered the Bubb Gambit: 1 Nf3 e5, 2 Nxe5 f6, but after an interesting start was able to exert some real pressure with his major pieces down the kingside files forcing his opponent into some serious thought. Ray was in a rook and minor piece endgame against Phil Harlow, and according to Alan, missed a win. Dave, too, managed to get to the endgame even on material, but his bishop and king were hemmed in by his own pawns, and eventually his position crumbled. So, our second Chapman Cup team goes out in the first round. We have the consolation of being entered into the Birstall Cup as first round losers. Tonight, HA1 play in the Wylie. Next Tuesday, at the Arms, we have two home matches: a Harrod Cup match (against Wigston), and our first Chapman Cup team play against Shepshed. On Tuesday we met at home for the second George Winterton Pairs Competition - our annual friendly against the Red Admiral. We used Harrod/Wylie Cup time controls and each pair played one game with the white pieces and one with the black. Pairs played without consultation and so had to work out what their team mate was thinking as well as their opponents. The first round went 2-1 to the Red Admiral. This should really have been 3-0, but Paul and Richard lost on time despite being two bishops up. Half time refreshments consisted of a choice of Chicken or Vegetable Curry with Poppadoms and Pickles, or Faggots, Chips and Mushy Peas. Our decision to substitute myself and Ray with Pete & Dave paid off with a win on board 2 at the end of a hard fought game against Andy and Mick. Round 2 finished 1.5 to 1.5 points and the match finished 3.5 points to 2.5 in the Red Admiral's favour making it two wins out of two to them. Well done everyone. Another fun, pressure free, evening. We look forward to next year. On Tuesday 17th May, Heathcote Arms 2 (HA3) plays at home against Wigston in the Chapman Cup, and on Wednesday, HA1 plays away in their defence of the Wylie Cup at Loughborough. Last night we had the first round of the Minor, Major, and Challengers sections of the County Championships. Ray was the first HA player to finish, having agreed to a draw offer from Dennis Wilkins. I then managed a surprise win against the comparatively strong Jez Wells (136). With the black pieces, I had been feeling quite comfortable. 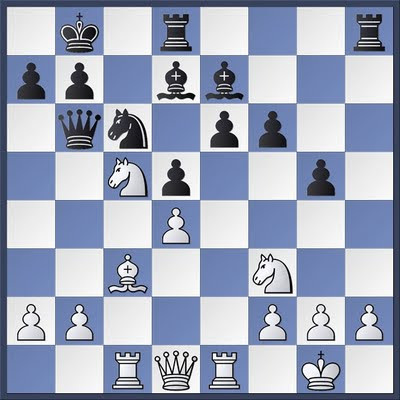 White had just played 17 Nc5. From here, i completely ruined my game with 17...Bxc5, 18 dxc5 Qxc5, 19 Bxf6 resulting in a discovered attack on my queen and both of my rooks being forked. I had just played 28...Rg8 and offered a draw. My opponent replied with a firm 'No' and then played 29 Qe5. This allowed 29...Nf3+ forking king and queen with the pawn unable to take. Jez resigned straight away. It is surprising how often i have my draw offers refused only for my opponent to blow up immediately afterwards. The last game in the room to finish was Haka Dave against Roy Lathwood. Dave had held the upper hand earlier, but things deteriorated later on. Afterwards Roy remarked to Dave that ''You were 5-0 up at half time''. On Tuesday 10th May, at the Arms, we have the George Winterton Pairs Competition against the Red Admiral. We are expecting 7 Red Admiral players. As with last year, pairs will be in order of strength and we will use Harrod/Wylie time controls and the pairs on each board (also as in the Harrod/Wylie Cups) will play one game with black and one game with white. There will be some hot food at half time (curry maybe?). 10th May George Winterton Pairs Competition. In addition, Heathcote Arms 1 (actually HA2) will also be playing in the Chapman Cup, at home, against Shepshed on either the 17th or 24th May. We have put some links on the website (on the right hand side). These include a link to the Master Game programmes that have recently appeared on you tube. Programmes from 1980,81 and 82 are being added over time. The 1981 final between a 15 year old Nigel Short and a stressed out Tony Miles is well worth a look. Besides the links, we have also put a counter on the website. We had over 500 hits last month - so someone is obviously visiting our site.